Pour your quinoa into a large bowl - rinse well with cold water. Drain water carefully. Repeat if desired.Using a large pot - bring your water and a pinch of salt to a strong boil. Add the rinsed quinoa. Cover with a small vent and allow to boil for 10-12 minutes on med-high heat.While the quinoa is boiling, chop your scallions and mushrooms, and set aside you coconut milk, almonds - and other ingredients.When the ten minutes is up, remove the lid completely from the large quinoa pot. Not all the liquid will be absorbed. Add in: all your almond, scallions and a splash of coconut milk. Also grind in some fresh pepper.Stir with a wooden spoon and turn the heat down a bit. The ingredients will begin to absorb more of the liquid and a thick risotto will begin to form.Next add in the nutritional yeast, maple syrup (just a splash), garlic powder and risotto mushrooms. Continue folding the quinoa until a moist thick consistency forms. Like a very thick oatmeal. Turn heat off and begin spooning the quinoa out of the pot and into a serving/storage bowl. You can also begin plating your quinoa.In the same pot, you will make the gravy. It's OK if some of the quinoa ( a few spoonfuls) remains in the pot. This will help to thicken your gravy.For gravy: add all the gravy ingredients and stir on medium until sauce thickens. Allow saffron to bloom. 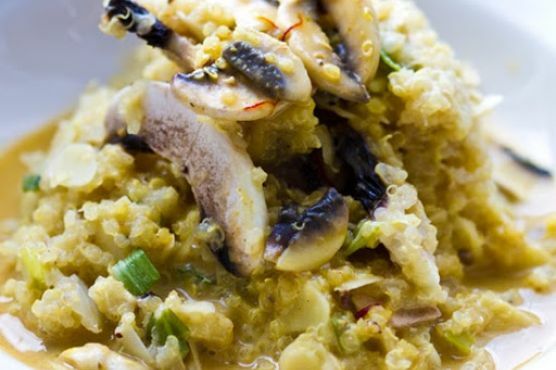 Remove from heat and spoon gravy over top plated quinoa - or transfer to a gravy serving bowl. Garnish with fresh pepper and plenty of mushrooms from the gravy. Serve warm - or store in fridge.